The house is a place of refuge and shelter from erratic weather. Also home made as a final destination after a day exhausted outside activity. The house also has a type, size, and shape different according to the existing land. In addition to the house, there are other factors that can support the formation of a healthy home, comfortable, pretty, beautiful and neat. Park is the supporting factors that have many functions and different types that can be adapted to home conditions. Park is also a natural energy that is the source of life for residents. Today, the garden is a garden-style minimalist's dream of greater acceptance by the owner of the house, but does not require a large amount of land, this type of garden is very simple and does not require too many materials and plant. Minimalist Park also has five types that can be integrated in the house. Minimalist tropical garden is a garden featuring a soft housing by causing organic lines of the park and neutralize a line of minimalist architecture. This type of minimalist garden are usually shades of gray or dark so that the color of the plants used are also matching. In addition to the display, you can use red flowers or pink to contrast with the color of the building. While plants can be planted the papyrus, bamboo. This garden style is perfect combined with minimalist-style residence for a calm appearance and monochromatic designs which display a variety of textures and shades of green plants. Usually plants are plant species Use Agave, Yucca, Nolina, and Sikas. Plants of this type are also very suitable if given special lighting so the park can be different at night. Japanese garden has started no longer popular today, but this type of park has a unique feature that is very thick with a view of philosophy. Strengthen monochrome color minimalist style. This type of garden usually use hard elements such as stone, sand, comb, wind chimes and bamboo shower. Try not to have garden pad bonsai plant, it will collide with the architecture of the house. This type of garden is not too popular in Indonesia. 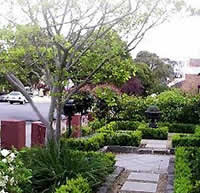 Usually used plants are colorful bush soft textured and shade trees. In addition the fences are shorter, picnic tables, and where the composition adds barbecue garden. Park English is usually used in a luxury building and using candles pine trees, manila grass and bushes neatly arranged symmetrical flowers. Additional decorations can be used is a shower, high garden lamps and garden chairs made from iron. Japanese Garden is y favorite one. It is really rather popular nowadays.